It is hard to describe my 16 day experience of building the guitar of my dreams – a once in a life-time experience will have to do. It started at 08h00 on a Tuesday morning. Three men, all over 60, committed to building a guitar and eager to accomplish this. The other two were very experienced carpenters but I was not – let’s say I knew that a chisel had a sharp end and a handle but I had no idea how to use it, and that sort of summarises my knowledge and skill level. 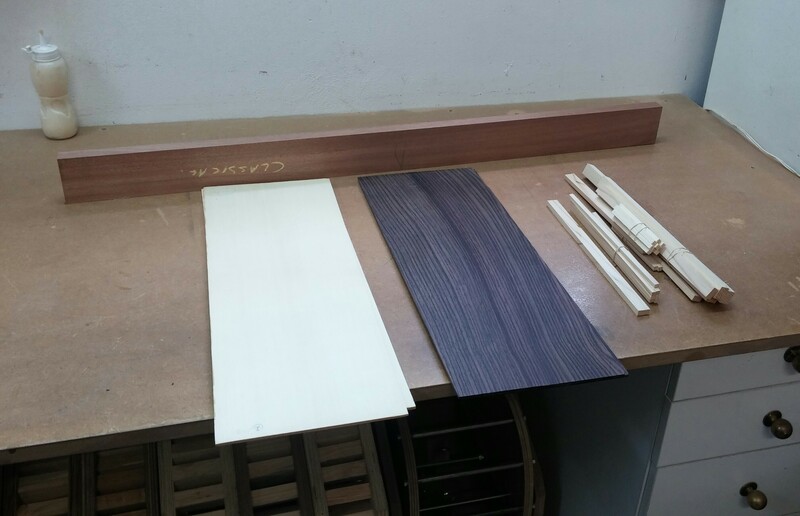 We started with a clean work station on which lay several pieces of wood. Indian Rosewood for back and sides, Engelmann Spruce for top, African Mahogany for neck, and lengths of spruce for the internal support struts. And so it began. It would be tedious for many if I described the whole process from start to finish but if you are interested in this then you can follow the day-by-day summary and photographs on the Guitar Venture facebook page (scroll down to view each days progress). Let me rather write about some of the things that struck me as interesting in the actual construction of the instrument. In my next post I will write about some of the life lessons I learned from the experience. It became obvious very early on that precision is a key issue in guitar construction. Everything is measured to within 1 mm or less and every join has to be a precise. All the parts fitted so snugly that it seemed that the glue we applied was just a belt-and-braces precaution. But precision was also important to ensure that the instrument was properly aligned and centred. Inaccuracy in the early parts of construction yields instability, lack of symmetry and playability issues later on. As the guitar slowly came together another key concept immerged – all the parts play a role in producing form, sound, and playability. The beautiful female form of the classical guitar is not just in its obviously curved body. The neck too is sculpted and smoothly curved. Inside the sound box are a couple of dozen struts, each of which is carved into curving tapers and rounded edges. If I had understood this from the start I would have named my guitar ‘Lady P’ and not ‘Dr Peppler’ (My wife Pat would have liked that I think). The finished product is of course an instrument designed to be played but it also something very beautiful. The sound that the instrument produces, its ‘voice’, also depends on many influences. The woods used are called tone woods because they have the characteristics that produce good clean sounds. The Engelmann Spruce top vibrates when the strings are plucked, the Rosewood back and sides reflect the sound back and out of the sound hole. The strutting attached to the inside of the top channels the sound and forms it, and even the neck vibrates in resonance with the notes produced. Any residual glue inside the sound box will impede the flow of sound. The strings, the struts, the neck, the top, the sides, and back all play a role; all the musician has to do is to initiate and order the sounds produced. I also learned that even the wood itself has a definite tone. Tap the soundboard before it is built into the body and it rings with a discernible note. My guitar sounded a clear C below middle C. There is a lot of debate about the significance of the ‘tap tone’ but the fact remains that the wood itself ‘sings’. Playability is also determined by a combination of several things. The fretboard must be angled slightly above the line from head (nut) to 12th fret. Each of the frets must be spaced down the fretboard to very precise measurements and they must be of exactly equal height. The bridge must be located at precisely the scale length (645 mm in my case) from the nut. The saddle must be just high enough to produce a clearance of between 3.5 and 4 mm between the 6th string and the 12th fret. The slots cut into the nut for the strings must be the right uniform depth. 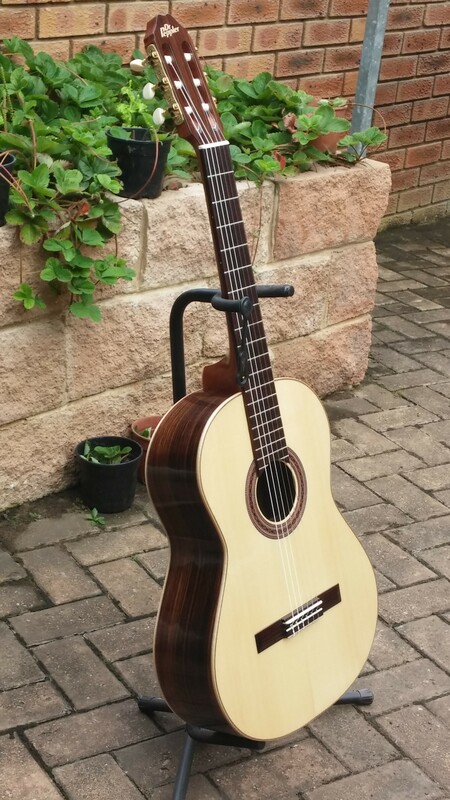 If all of these are correctly formed and positioned then the guitar will be a pleasure to play; if they are not then the guitar might sound OK but be hard to play. I was surprised and intrigued by the complexity of the guitar and by the degree of craft and workmanship that goes into its construction. You can view a pdf of the powerpoint presentation The Conception and birth of the Dr Peppler Classical Guitar. In my next post I want to explore some of the spiritual applications and life-related lessons that surfaced for me during the 150 hours construction process.